A few of you reading this may know a bit about me, or even know me personally, and if you do you would know that even though I am an established and confident designer, my current goal in life is to work with books as a designer and illustrator, and further to publish my own children’s book. It is here in this series of blogs that I will chronicle my journey to the conclusion of a published book. The first thing we should discuss is my why. Why do I want to publish a children’s book? I do not have children (yet) to share my stories with and I don’t remember reading as a child. But I wish I did. I am an avid reader and bibliophile, but this didn’t really come about till mid way through high school for me (around 9th grade for non-Australian readers). I discovered reading quietly on my own, I am a slow reader and was shy to admit to my book obsessed friends that I enjoyed books too because it would take me a month to read one when they had read 10. I even got shamed in front of my english class by my teacher because I was reading our assigned book too slowly, apparently reading every night wasn’t enough for her. But I have gotten off topic. The reason I want to write and illustrate books for children is because I believe reading in a vital happiness in life and I want to help young readers discover this as early as possible and not be like me in their mid twenties returning to famous children’s and middle grade books to read them, because I had missed out on them in my youth and want to know what the fuss was about. Even though I am an adult, I have a guilty pleasure for collecting beautifully illustrated children’s books. From Shaun Tan to Oliver Jeffers, I have a collection any child or mother would envy. I love the world and colours that come in children’s books and the level of imagination that they trigger. My journey into children’s publication started 3 or so years ago at university when I was assigned to illustrate a book. I fell in love instantly. I had decided that apparently the task of illustrating an entire book wasn’t challenging enough and thought I would also teach myself to use a new medium at the same time. This is when my little university project of ‘Clancy of the Overflow’ came into being. 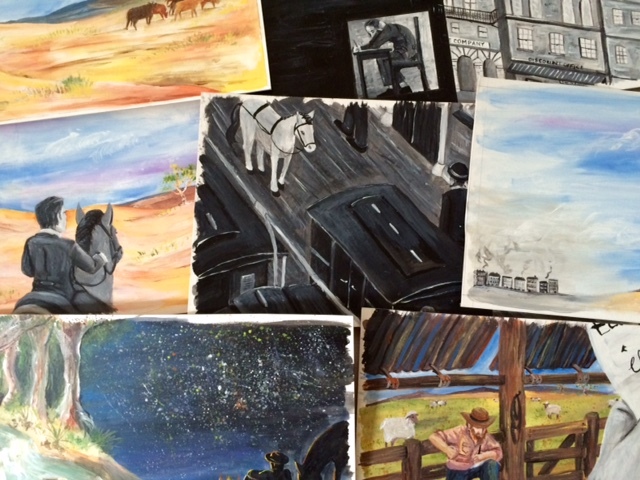 A collection of the original paintings used in creating the book. As you can see from the pictures I illustrated the book through acrylic paint on art board. the whole book was around 32 pages and it was a broken up version of the famous Australian poem, ‘Clancy of the Overflow’. The whole process from story boarding to finished product took a semester to complete and I learnt so much along the way. I learned more from making mistakes then my class curriculum but that is what life is all about, mistakes help us improve for the next time. In the following blog I will go through my entire process from start to finish of that first book. The first of three (and a half) I have currently illustrated. I hope you can join me as I continue this journey of learning and art as I make my way to a published children’s book. I invite you to comment and question and share advice on this blog for me and for others. I know I am not the only person on this journey and I hope we can all grow together to get to our goals.